Feeding the meter at New Canaan's two railroad parking lots is often a hassle for commuters taking the first trains in the morning, especially if the person is using a credit card. The frigid cold temperatures often make the situation worse to those in line to pay for their spots. The town's Parking Bureau is hoping to eliminate that problem by launching a new smartphone app that would allow commuters to pay for parking without having to use the machine. The new system, as well as the introduction of a license-plate reader for parking enforcement officers, gained the support of the Board of Finance Feb. 11. The PayByPhone app initially would be available at the railroad parking lot downtown and at the Talmadge Hill train station lot. 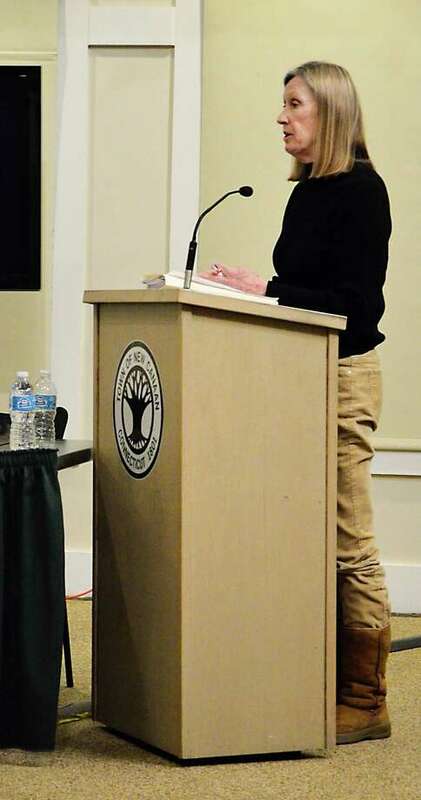 If successful, the system would eventually be implemented at other municipal parking lots in New Canaan, parking officials said. Parking Bureau Supervisor Karen Miller said commuters have been requesting an alternative to the meters for a long time. "It will offer our commuters who rush to the train every day (a way to) bypass the machine, get on the train, pull out their phone and go to the app and pay," Miller told the board. The license-plate reader would consist of two cameras, which would be mounted on the right and left sides of a parking department's vehicle and would alert officers to cars that have exceeded the parking limit and cars that don't have permits, among other functions. With the system, parking officials could, for example, drive on Elm Street and record all the license plates. Two hours later, they could go back there and an alarm would sound for any vehicle that has exceeded the area's 90-minute parking time limit. To fund the projects, the Board of Finance approved four transfers in the Parking Bureau's budget. The money was taken from office supplies and the electricity accounts. "We're going to sacrifice some of our office supply budget (to support it)," Miller said. "That's how strongly we feel about it." The license-plate reader costs $18,000. PayByPhone has a $1,500 set-up cost and a monthly fee of $200. However, the town won't have to pay the monthly charge as long as there are at least 1,000 transactions a month. If half of New Canaan's commuters use it, Miller said, there will be about 2,400 transactions every month. "We've had so many requests for this," she said. "I think it'll be really well received." The cost for each PayByPhone transaction is 35 cents, which would bring the annual total for daily commuters to about $84. "The fee is really being passed along to the commuter, but believe me, they're very willing to pay," Miller said. Formerly known as Verrus, PayByPhone is part of PayPoint, an international provider of payment services. As for the license-plate reader, Board of Finance members noted there's a fear that the databases could provide a log of where people are and for how long, but Miller said the department would not be storing any information. Town Council member Roger Williams said he would be looking into the project "to make sure there's no capturing of data." "Essentially, my concern is with a massive invasion of privacy," he said. "Is it going to capture data while it goes to the parking lots? Is it going to create a database within the public record?" Christopher Kaiser, the town's director of information technology, said the database would be strictly used for parking enforcement and would be rewritten every 24 hours so that there's no storing of data. The system also would eliminate the need for permit stickers or slips. The Town Council is scheduled to consider the request for the license-plate reader at its meeting Wednesday, Feb. 26, at the Nature Center, according to Miller. If approved, it would just take a few days to install the cameras and software, she said. The PayByPhone project is expected to go to the Board of Selectmen Tuesday, Feb. 25, at the police station. If approved, it would take about five to six weeks to implement it, Miller said. The only PayByPhone payment option would be for 12 hours, which would be good for the whole day, since parking is not enforced after 4:30 p.m.
Miller said the current parking machines are "very frustrating," especially because they take a long time to process credit card authorizations. She noted that the process is even worse in the winter and during the early morning hours, since most of the commuters get on the first two trains. "Literally, they're all lining up in freezing cold weather at the machine," she said. "Some of them are trying to pay by credit card and it doesn't always work the first time. It's very frustrating." Miller said the PayByPhone service would be integrated with the current system so that the parking transaction can automatically show on the enforcement officers' tablets. If for some reason the app does not work, commuters will have the option of making the payment through a phone call. Commuters still would be able to use the meter machines to pay with cash or credit cards. At the Greenwich train station parking lots, where PayByPhone has been used for about two years, the system has been increasingly getting more users, according to Roderick Dioquino, business operations supervisor for Greenwich's Department of Parking Services. "It's been pretty good," he said. "I would imagine it's because it makes it easier to pay for your spot." Dioquino said about 1,700 commuters use the app in Greenwich every month.